One of Jonathan Hobin’s works shows child models depicting torture of inmates at the U.S. Abu Gharaib prison. Art and Controversy is both title and theme for a day of exhibits, dialogue and a panel discussion at UBC’s Okanagan campus on Monday, November 4. Everyone is invited to participate in the events, which are free and open to the public. The event includes an exhibition in the Fine Arts Gallery, a public lecture by visiting artist-photographer Jonathan Hobin, as well as a panel discussion. The idea for the event was initiated by controversy surrounding certain artworks that have been displayed on campus from UBC’s Okanagan campus Public Art Collection. 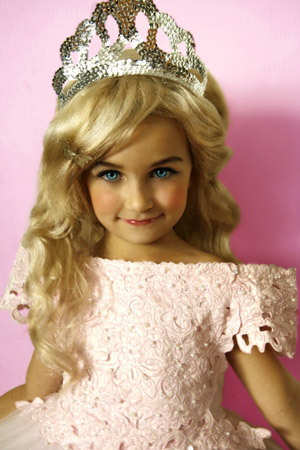 Kassy Davis’s photography, themed ‘Pageant,’ shows images of young girls manipulated to look like child beauty pageant contestants. “The mandate of the Public Art Collection is to provide a compelling and distinctive collection of art that will educate, stimulate and enrich the campus experience for the university community, alumni and our many visitors," says Susan Belton, curator of the collection. "Certain works are greeted with resistance. Today's art is more likely to be about intellectual challenge than décor. Curators and administrators struggle with balancing the principle of academic freedom and finding appropriate, non-confrontational ways to express and exchange such ideas," says Belton. "The goal of this initiative is to engage the public with some of the difficult themes being explored by contemporary artists,” says Helfand. Kelsie Balehowsky, a fourth-year Fine Arts student, received a UBC Tuum Est grant to facilitate the event. As a student and contemporary artist, Balechowky says it is important to raise social awareness about controversial art and creative expression. Exhibition – November 4 to 8, from 8:30 a.m. to 4 p.m., exhibition at the Fine Arts Gallery located in the main foyer of the Creative and Critical Studies Building. The show is curated from the UBC Public Art Collection and also features a slide presentation of work by visiting artist Jonathan Hobin as well as additional works by Kassy Davis, a recent UBC fine arts graduate. The artists will be present for a special viewing from 5:30 to 6:15 p.m.
Public Lecture – Noon to 1 p.m., Hobin presents a public lecture in the UBC Student Union Okanagan Theatre, J. Peter Meekison Centre for Students, Room UNC 106. Public Panel and Discussion – 6:30 to 8:30 p.m., University Theatre, Room ADM026, Administration Building, Faculty of Creative and Critical Studies Dean Wisdom Tettey will moderate a panel on Art and Controversy with Hobin, Associate Professor Robert Belton and recent bachelor of fine arts graduate Tonya Freake. Discussion will follow. Jonathan Hobin is an award winning photo-based artist working in Ottawa. 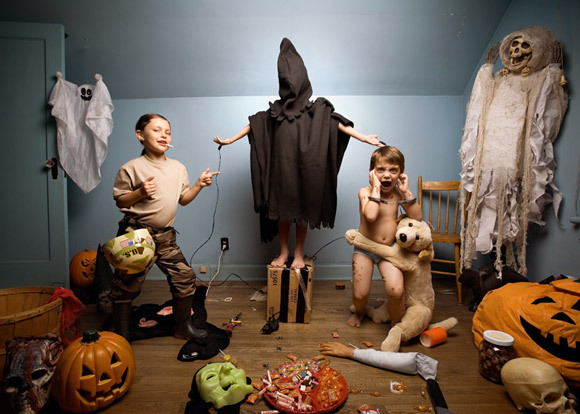 He has used children as models re-enacting infamous controversial photographs and scenes from the media such as images of 9/11 and inmate torture at the Abu Gharaib prison. Critics have both praised and denounced Hobin’s work and use of children models. His photographs evoke controversy wherever they are shown and have appeared in newspapers and magazines, as well as on CNN’s Newsroom, Jian Ghomeshi and other CBC TV and radio shows. Kassy Davis is a recent UBC Okanagan campus bachelor of fine arts graduate. Her series titled ‘Pageant’, comprised of young girls manipulated to look like child beauty pageant contestants, has sparked controversy within the university. Her work is part of the Art and Controversy Exhibition group exhibition. For more information on the event please contact fern.helfand@ubc.ca or kelsie.balehowsky@hotmail.ca. For more information about UBC’s Okanagan campus Public Art Collection, please contact Susan Belton, susan.belton@ubc.ca.